Full Color, Large Format Poster Printing. Need a Free Custom Poster Printing Quote or help with ordering? Call us at (702) 589-6429 to discuss Poster Printing prices and options. Print Bulk, Large Format, or Mounted Posters! Want to quickly brand your small business in a powerful way? Poster printing is the answer! Posters have been an effective, high-impact advertising piece for many years! 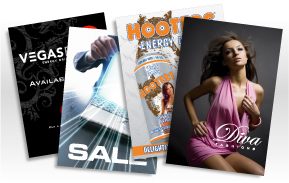 Our posters are sure to stand out with our state-of-the-art printing presses and thick premium paper stocks. Make a poster, make a statement, make a new customer. Need a small, medium or large run of high quality four color posters? We can help. Small, medium and large sized posters are just a mouse click away. Quality four color posters are available in many stock options to provide for affordable short term use or durable long term placement. As far as poster size goes, you can choose from one of our standard poster size options or go for our custom poster printing option. We have different full color poster printing options. We have bulk posters where you could order in huge quantities (50-100,000). You could also check out our large format posters where you could print your designs on photo-quality paper. Finally, you've got mounted posters. Mounted posters or poster signs are printed directly onto 1/8" white PVC foam board.